Vijay television has official announced the launch date of Bigg Boss Tamil season 2. The show which is all set to host by Kamal Haasan to begin on 17th June, 2018. Star Vijay Television recently posted a new promo of BB tamil season 2 featuring Kamal Haasan in which they announced the launch date and timing. Bigg Boss tamil creates huge buzz among the audience ahead of its launch. The biggest television show of tamil which grabbed huge attention among small screen audience last year now all set for season 2. 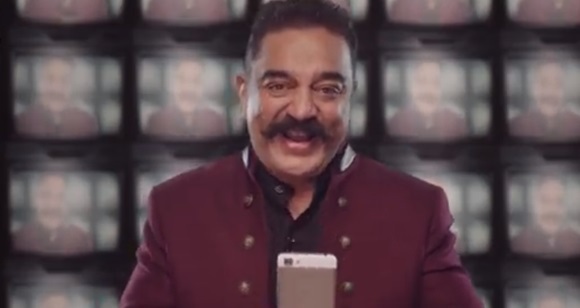 People are excited to see Kamal Haasan as host again in the show and eagerly looking to know about contestants. There are lot of speculations doing round regarding contestants of bigg boss season 2 in tamil, however no official announcement made till now regarding the participants. Some of the rumoured contestants for the season includes Simran, Bharath, Powerstar Srinivasan and more. Bigg Boss tamil 2 will have 15 contestants who is going to isolate in purposely build house for 100 days without any communication with outside world. Each week one contestant will be eliminated from the show based on Public voting. The show will have some interesting task every week which challenging contestants by both mentally and physically. The second season of bigg boss in tamil will telecast in Vijay Television starting from 17th June, 2018 at 9 AM. The show will be airing from Monday to Sunday at same time and Kamal Haasan will host during weekends.